Love the red, white and blue? 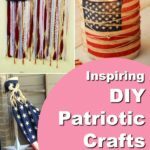 Then these DIY patriotic crafts are just what you want for your 45hof July decoration. But don’t think these holidays crafts are just for… well, holiday.